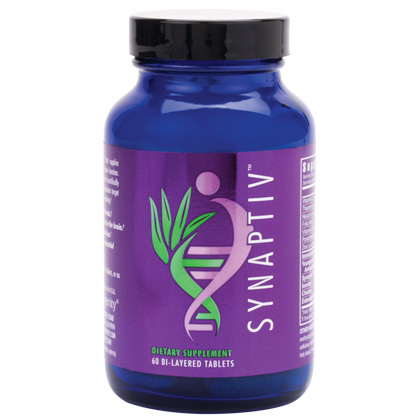 Through an advanced bi-layered tablet, Synaptiv™ is able to provide instant mental clarity and decreased stress levels while also providing extended support to help combat free-radicals for optimal brain health. This scientifically developed formula satisfies both immediate needs and long-term brain health requirements. Ingredients: Vitamin C, Thiamin, Niacin, Folic Acid, Vitamin B12, Pantothenic Acid, Zinc, Bluenesse® Brand Lemon Balm Extract, Huperzine-A, Inositol, Choline, Youngevity Full Spectrum Antioxidant Blend, Synaptiv Complex, Vegetable Cellulose, Microcrystalline Cellulose, Silica, Magnesium Stearate, Amla, Guava, Holy Basil, Lemon, Brown Rice, Curry Leaf Extract and Water.